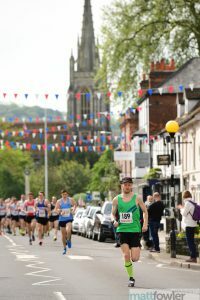 ROB CORNEY completed part two of his grand scheme to rewrite the Reading Roadrunners’ record books when he won the Marlow 5 in 25 minutes and 42 seconds. That was despite being, quite literally, held up in traffic during the race. Rob lost time when the pace car pulled up in front of him to avoid back-markers running on the wrong side of the road at a point where the course revisits a street used at both one and four miles. Nevertheless his time in the fourth round of this year’s club championship improved the previous best set by Mark Worringham at Headington two years ago by 21 seconds. Then Corney revealed that his achievement in his first competitive race at the distance was the second time he had broken the old mark in a week. “I was through five miles in pretty much the same time during the Shinfield 10k on Monday,” he said. It was Rob’s second club record of the year, he having lowered the long-standing half marathon mark to 1:09.20 with his second-place finish behind Scott Overall at Wokingham. His next target will be the club’s 23-year-old 10k record of 31:38, set by the Ethiopian Zak Tsegay, when he races the prestige Vitality London event on May 28th. And once again he is ahead of the game, having been inside that time when he went through 10k during the Maidenhead Easter 10 miles event. But Corney was only one of seven Roadrunners to mount the podium at Marlow, with our ladies squad of Gemma Buley, Katherine Sargeant, Helen Pool and Julie Rainbow having captured the team prize, all four of them running personal bests. There were also individual prizes for second-claimer Ben Paviour (MV40) as well as Ed Dodwell (MV60), who was claiming his fourth such award in the space of a remarkable 15 days. Gemma Buley was our first lady home, and fourth overall, in a time of 32:07, a PB with more than six minutes to spare. She had celebrated her 26th birthday six days earlier with a two-minute PB in the Shinfield 10k. 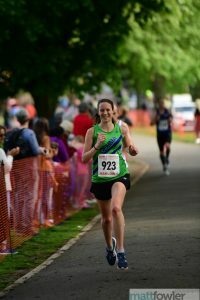 Katherine captured the FV40 age category prize to follow up her excellent time of 3hr 14mins in dreadful conditions at the Boston Marathon. 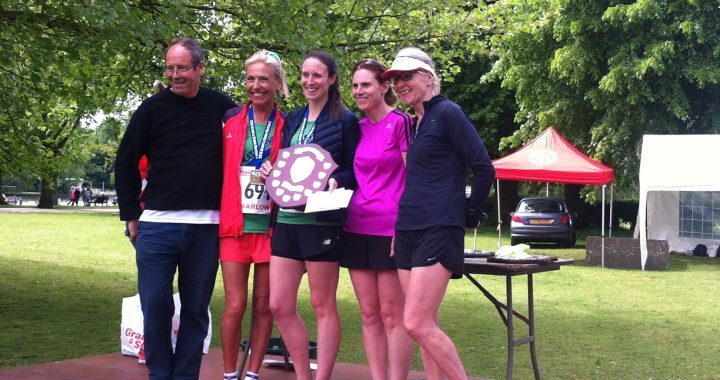 Helen also made a second trip to the podium with runners-up prize in the FV40 group, having shaved seven seconds off her PB. 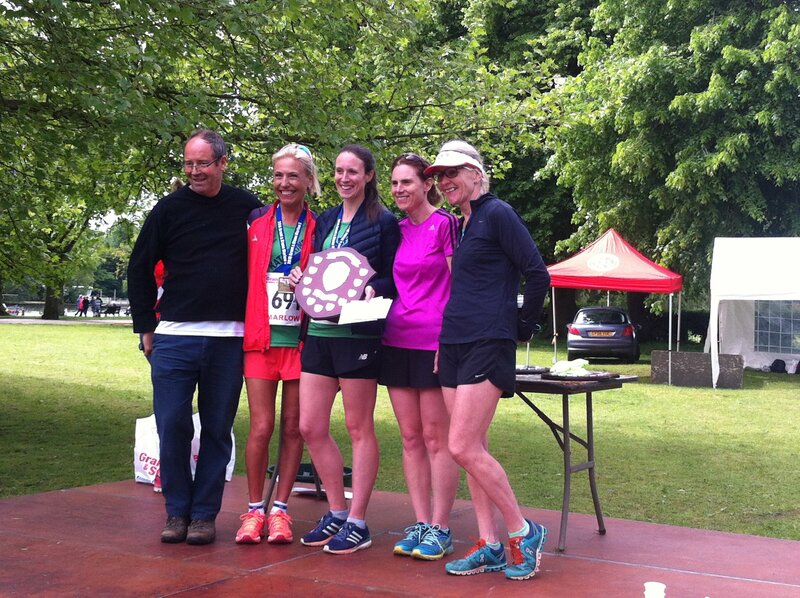 And Julie made it a clean sweep of PB’s among our successful girls, coming in as fourth scorer to clinch the award. Roadrunners were controversially denied a team prize double when the race organisers decided that Paviour was deemed to have entered to represent his first-claim club, Herne Hill Harriers. Ben was wearing our green vest and finished fifth overall in 27:10. With Corney’s first place, Stephen Ridley in eighth and Ben Whalley 22nd, that should have left us clear winners. But the organisers were having none of it and our next finisher, Pete Jewell, despite PB’ing in 42nd position couldn’t quite get us across the line. Pete had plenty of consolations… a county championship silver medal, all 50 points in his club championship group as well as 50 more in the prestigious age-grading section (pipping even Corney), and a first PB for five years. 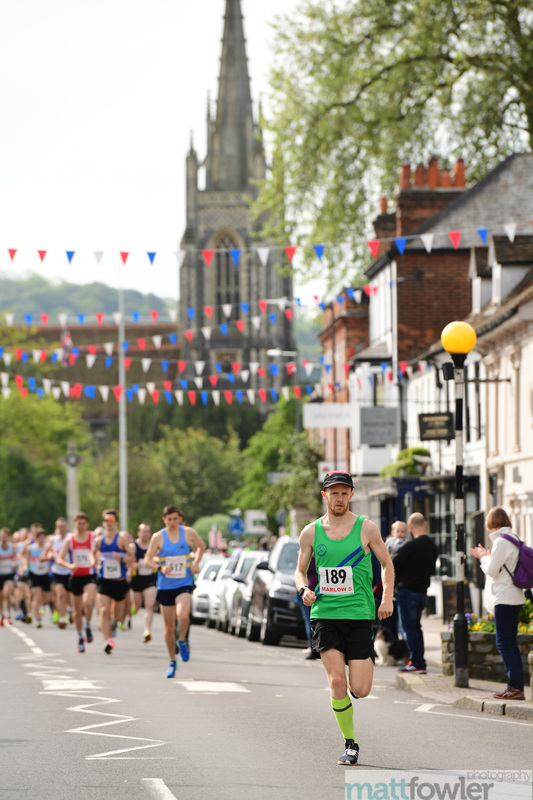 He was one of no fewer than 13 Roadrunners who picked up Berkshire championship gongs in the final event of the county’s road-running programme. Gold for Corney, of course, in the senior men, and a bronze for Ridley; silver for Ben Whalley in the 40-49 group; silver for Jewell and bronze for Alex Harris in the 50-59 section and a clean sweep in the 60+ category, where there was gold for Alan Freer, silver for myself and bronze for Andy Atkinson. The ladies among the bling were Gemma, with a senior silver, Helen Pool with a 35-44 silver, Sam Whalley with a 45-54 bronze, while in the 55+ group coach Lesley Whiley took silver and Susan Knight bronze. All that success led to nine more medals, including two golds, in the county’s overall awards for their four events at Wokingham, Maidenhead, Woodley and Marlow. Alan Freer emulated Corney by finishing with a perfect record of four golds, so they will both have a fifth gold to help them celebrate. There will be silver for Alex Harris (V50) and Andy Atkinson (V60), plus a bronze for myself. Among the ladies there will be more silvers for Gemma and Helen Pool and bronze medals for a couple of new names enjoying county success, Helen Dixon (seniors) and Paloma Crayford (FV45). Some of those girls were also able to celebrate taking full points in there club championship… Gemma (senior), Helen Pool (V35), Katherine Sargeant (V45), Lesley Whiley (V55), Heather Bowley (V65) and Cecilia Csemiczky (V70). The men who picked up the full complement of points were Corney (senior), Ben Whalley (V40), Pete Jewell (V50), Alan Freer (V60), David Dibben (V65) and Jim Kiddie (V70). Those not already given a mention should go to the head of the long list of those who claimed a PB… Tracey Hicks, Vince Williams, Adele Graham, Hilary and Peter Rennie, Stewart Wing, Helen Dixon, Susan Knight, Paloma Crayford, Sam Whalley, Katherine Sargeant, Julie Rainbow, Fergal Donnelly and Pete Jewell should take a bow ahead of the usual suspects, Gemma Buley, Helen Pool, Stephen Ridley and Rob Corney. The club championship roadshow quickly moved on to the second of its three 10-mile events, this time at Hook. Whether or not next year’s championship includes the Marlow 5, I would strongly advise anyone who has not already done so to give this race a try. It’s my idea of a value-for-money event, being comparatively cheap to enter, well organised with generous vouchers for prize-winners from Runners’ Retreat, a quality T-shirt for finishers as well as a bag full of goodies and results published almost as soon as you cross the line after a race which provides a great chance of a personal best. Respect to the Handy Cross club for their organisation! Come on Dave as an old hack you can’t sit on this one!